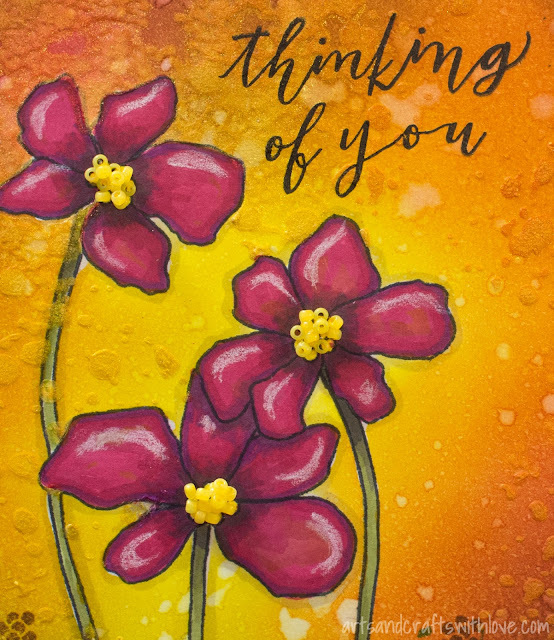 Both of these cards have watercolor paper as card base. I wanted to use watercolours but avoid the extra step of preparing the paper with clear gesso or such. Heavy watercolor paper was the easiest choise! 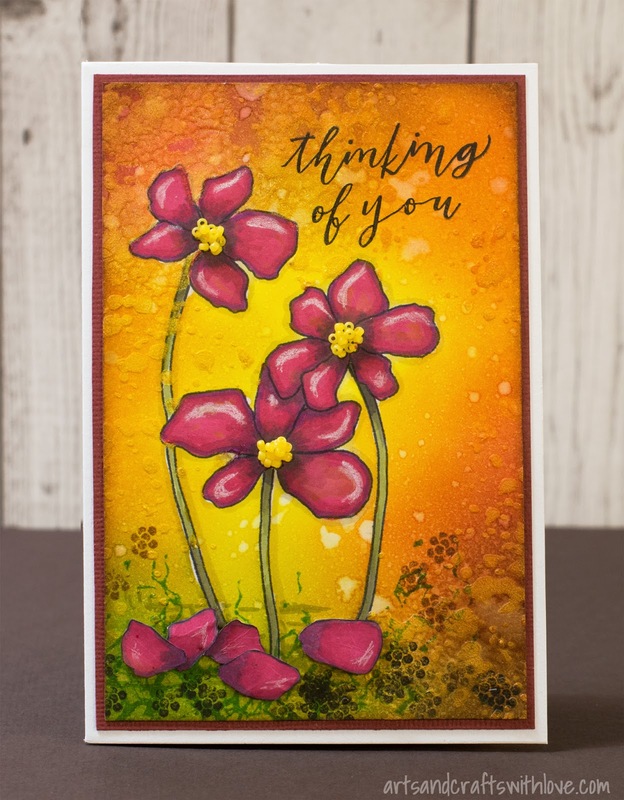 Once the watercolor was dry I decorated the backgrounds with stencilled patterns, using texture dies from Tim Holtz/Sizzix Mixed Media Thinlits die set. 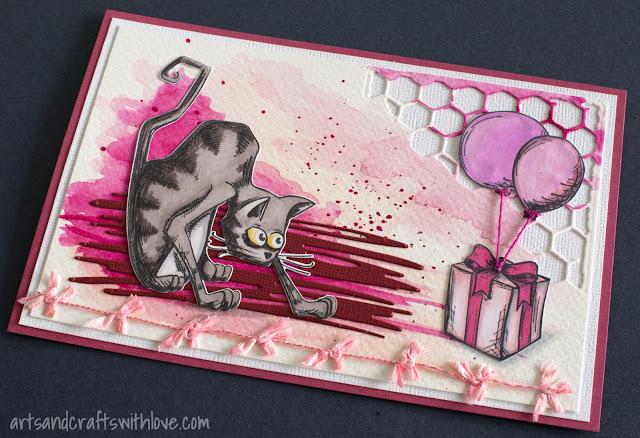 For the below birthday card I die-cut also die-cut dark pink scribbles using *this* fun Tim Holtz/Sizzix set. 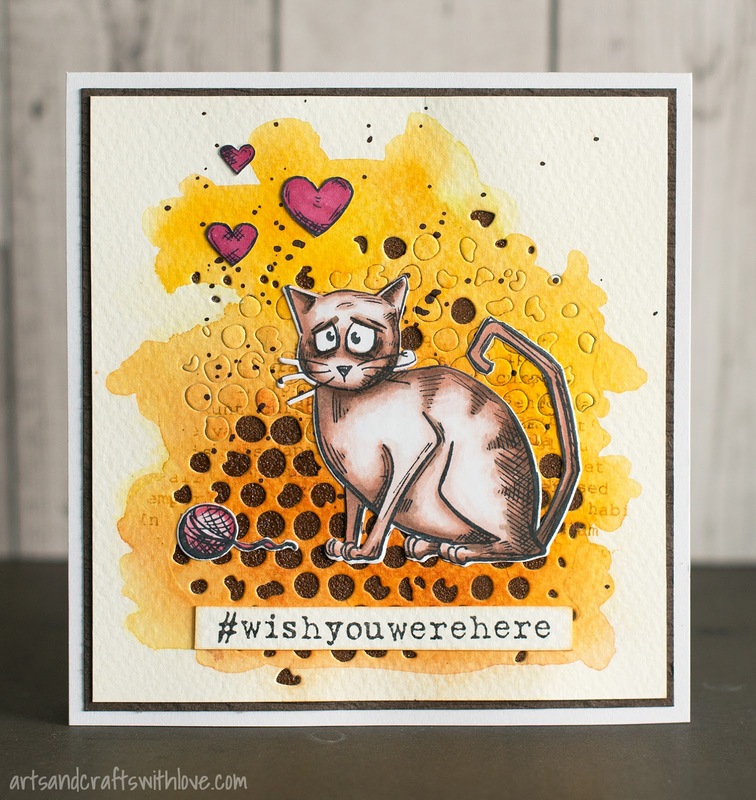 For this one I used heat embossing for adding some darker brown colour on the watercoloured background. I die-cut the pattern twice, but before removing the die I adhered two-sided tape on the background. When removing the die I pressed the scrap pieces on the tape, creating a nice pattern on the background. 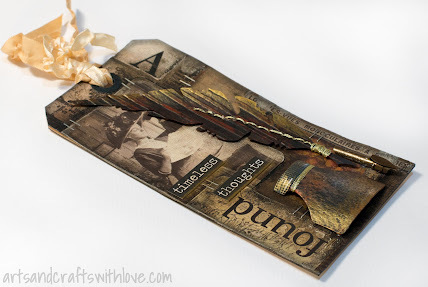 On those areas where the scrap pieces were removed I sprinkled brown Distress embossing powder. Double sided tape acted as embossing ink, making the heat-embossing so easy! 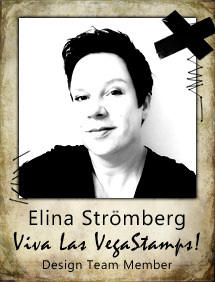 Wishing you a creative and nice weekend! It had been a while since my last tag in '12 Tags of 2016', but this month I just had to play along. Collage background, crackles, die-cutting and embossing, metallic shimmer, and layered painting. Just my style of recipe! 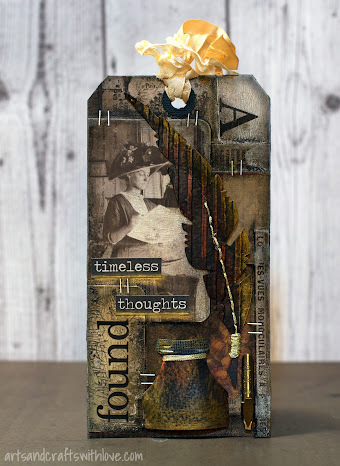 The lovely feather pen and ink bottle were die-cut using the 'Writing Desk' Sizzix/Tim Holtz Bigz die. 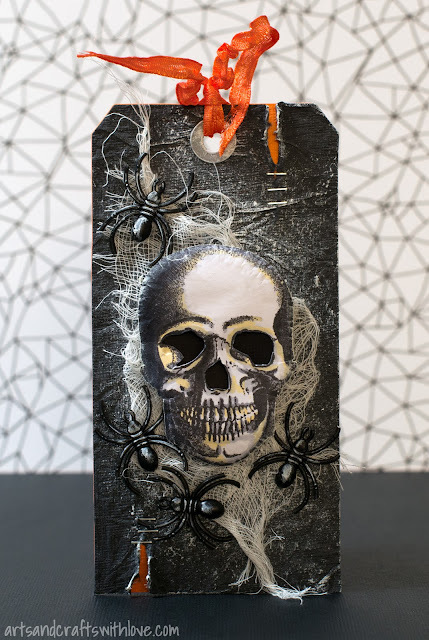 I did not use metallic foil but heavy watercolour paper, but decorated it according to the sample project (embossed it using 'Harlequin & Stripes' Sizzix/Tim Holtz embossing folder, and painted it with copper and black paints. 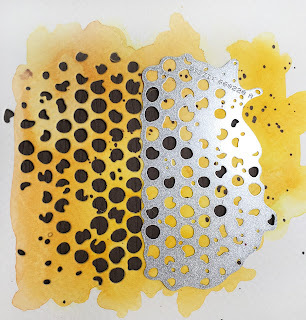 The cool golden shimmer is made using Old Gold Metallic! by 13Arts. Love that paint! 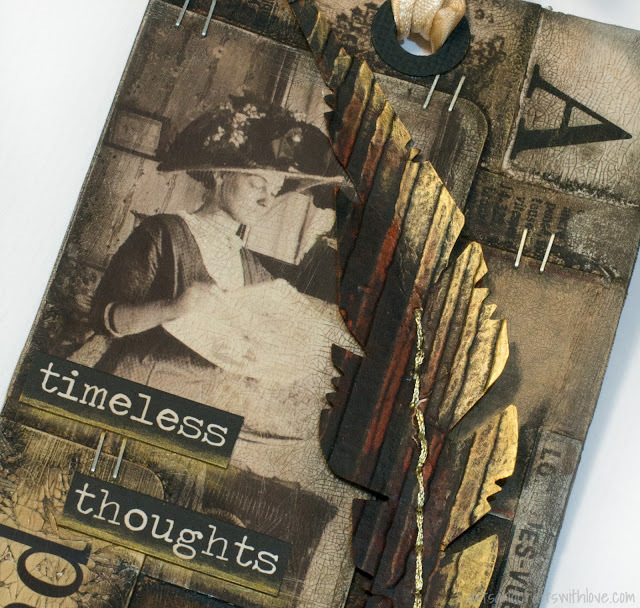 Oh, those crackles - that collage crazing medium is amazing! Even though vintage is not really my thing, I'm very happy with the outcome. Just my type of project! I know what I'll be doing this weekend. Catching up on the previous '12 Tags of 2016' projects! Less than two weeks to Halloween! Wow! Even if Halloween is not such a big thing in Finland I can feel the Halloween excitment rising as my kids are making plans for their Halloween parties. Their joy and eagerness is so contagious. 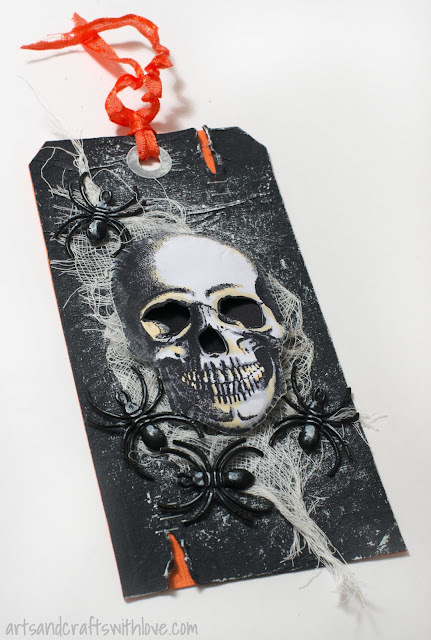 The size 8 tag base is die-cut twice; once from orange cardstock and once from black texture paper. Before attaching the tags I tore the paper on top and bottom edges, revealing a bit of the orange background after the tags were glued together. While waiting for the glue to dry I dry brushed a hint of white gesso on the black background. A very thin layer of white gesso is always an easy way to highlight the main items. I stamped the skull on white cardstock and coloured it with grey and yellow markers. After colouring I removed the eye and nose areas with a crafting knife and fuzzy cut the skull out. For creating more dimenstion on the card I pressed the edges of the skull with a stylus, and attached the image on a piece of black cardstock with 3D foam pads. The little spiders I had bought from a local 'Tiger' store that sells fun decoration items for low prices. After gluing them on the tag I brushed some white gesso on them, too. The tag turned out just the way I wanted. 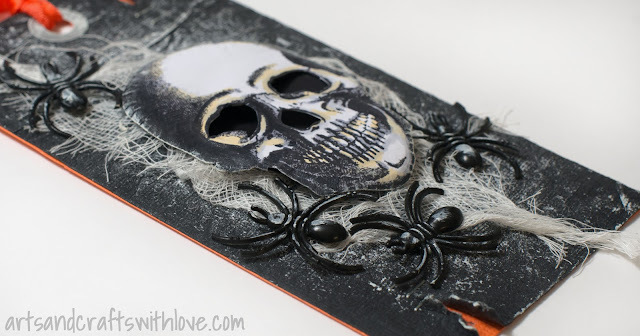 Creepy spooky, but fun! Wishing you a sunny October day! Thanks for visiting my blog! 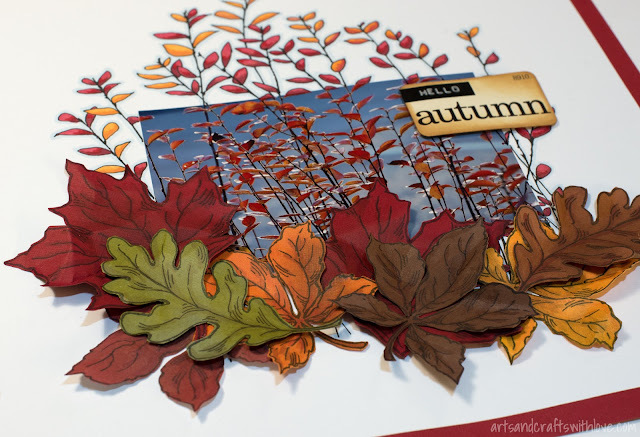 Craft Stamper Take It Make It challenge with theme 'Autumnal Creations' continues. 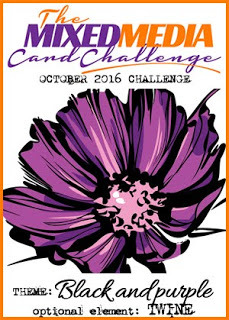 Gorgeous and colourful projects have been linked to the challenge- I hope you have time to play along, too. Just follow this link to add your project to the link list and you might be the lucky winner of WHOLE SET of eight brand new stamp releases by That's Crafty. Worth playing for, isn't it! 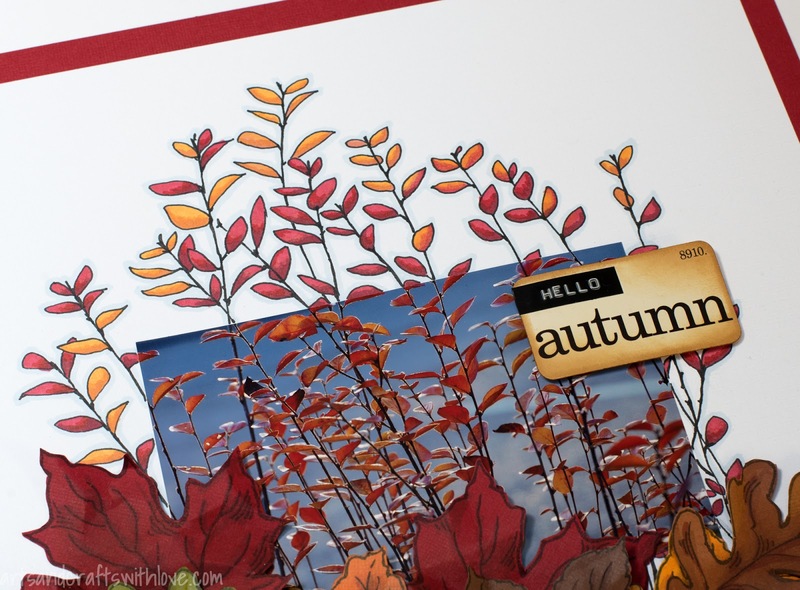 For highlighting the rich autumn colours on the photo I decided to leave the background completely white. 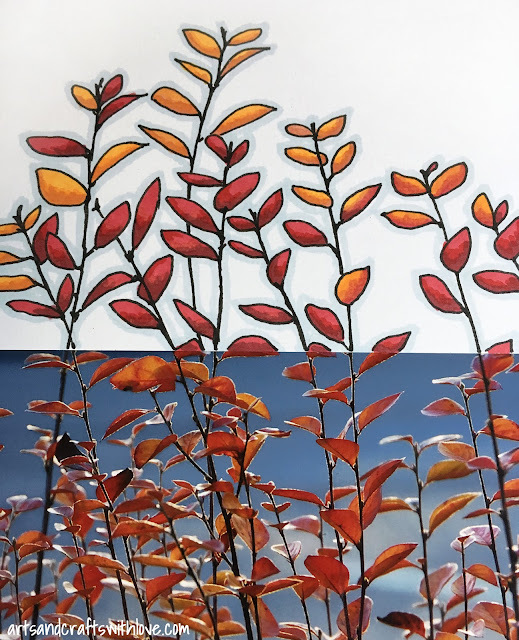 I continued the branches on the picture by drawing them on the background with a black marker and colouring them with yellow and red Promarkers. For lifting the coloured stems from the background I outlined them with light blue colour. I thought about adding some black or yellow paint splashes on the background but then decided to leave it and go with the white and clean version. The large leaf stamps are from a Stampendous stamp set. 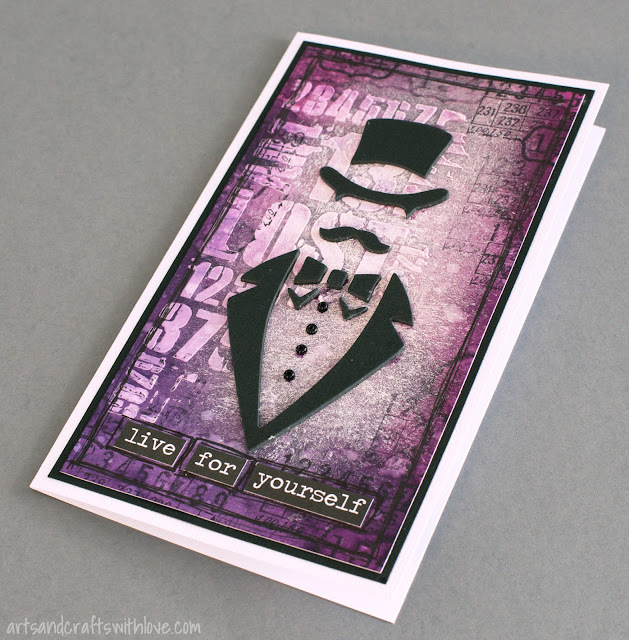 I stamped them on pieces of coloured scrap paper, inked and coloured them and cut out. Before gluing the leaves on the bottom of the page I crinkled the edges on the palm of my hand. Thanks for stopping by. 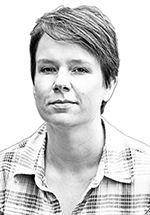 Hope you have time to leave a quick comment; it would make me so happy! Beginning of October has been quite busy but in a good way; I have spent lot of time in our garden, planting and preparing the flowerbeds for winter. I have a feeling that winter will be here really soon; last night the temperature dropped already below zero! Cold weather makes you dream about travelling somewhere nice, where you don't yet have to wear your winter jacket. Unfortunately I will have to wait some time for the next vacation, and my recent business trips have not taken me any further than Stockholm where the weather is very similar to ours in Helsinki. I guess I just need to continue dreaming! 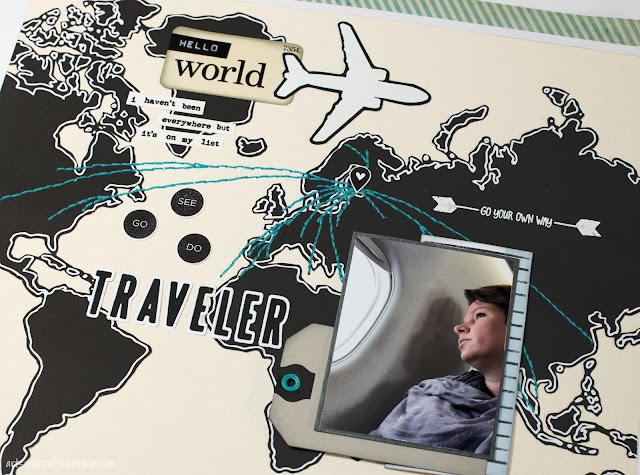 The world map is cut from a Studio Calico paper (Galileo from June '15 kit) and glued on cream coloured background. I marked some of the places I have visited, and connected the city to my home city with a stitched line. The photo is one of my favourite travel photos, a selfie I took on the plane. 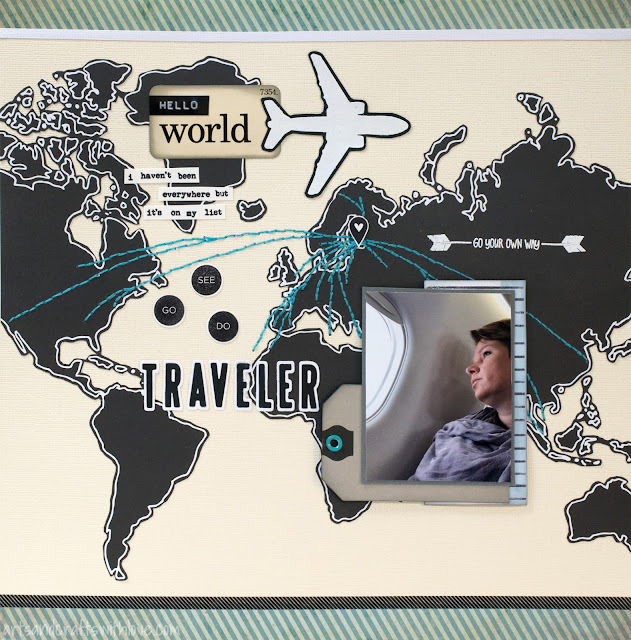 On the world map there are several places I have not visited yet. But those for sure are on my (bucket) list! 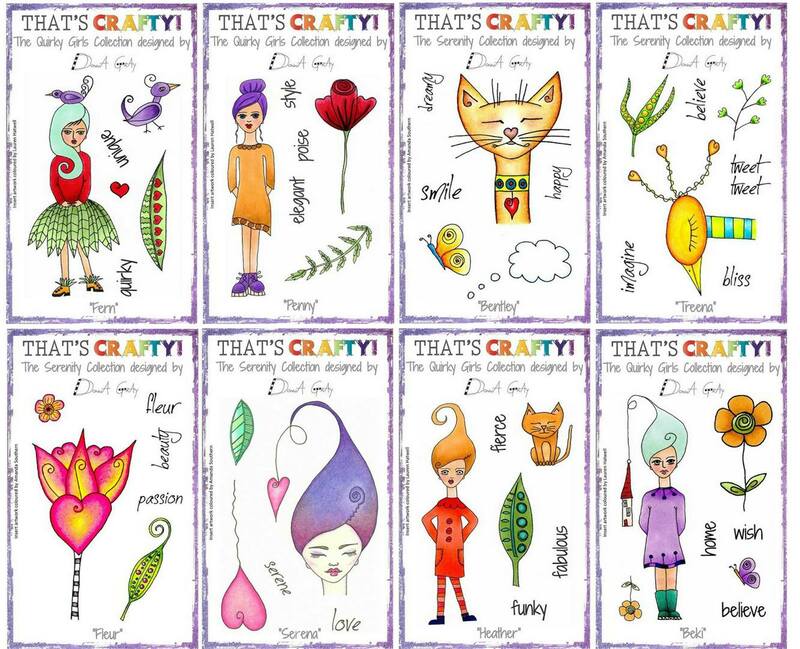 Our lovely sponsor this month is That's Crafty!, and one lucky winner will get a set of eight (!!) stamps by That's Crafty! 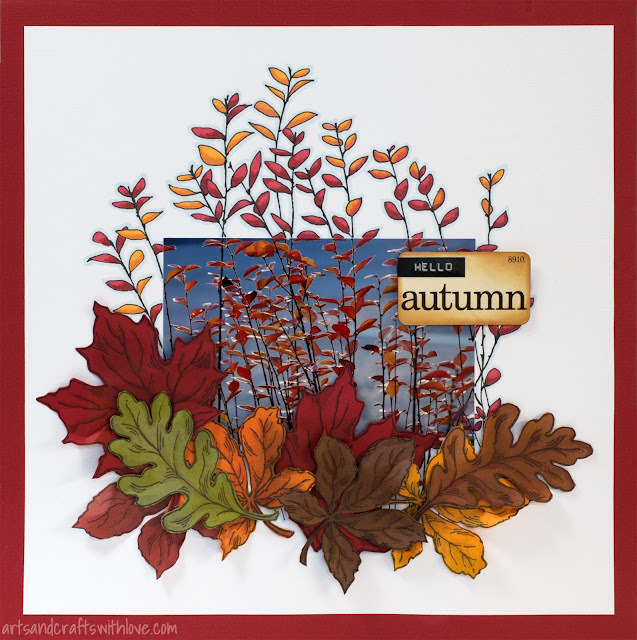 My stamped autumn card was created using lovely Simon Says Stamp flower stamps and two masking techniques. First I layered the stamped images using masking stamping technique, and then covered the stamped images with masking fluid before continuing working on the background. 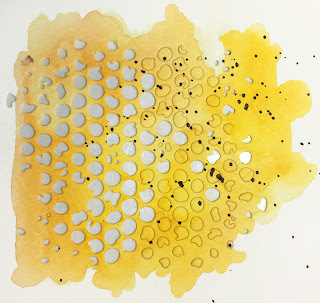 Masking fluid is liquid rubber, and once it dries it's almost impossible to remove from a standard brush. 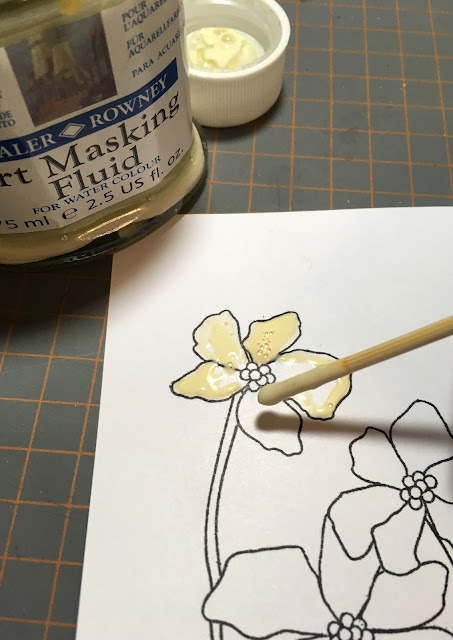 Silicone brushes are great to be used with masking fluid and the dried rubber can be easily peeled off from the non-stick coat, but wooden BBQ skewers work just as well. The background is coloured with Distress inks and gold colour texture paste. For colouring the flowers I used red and dark purple Promarkers and a white pastel pencil. 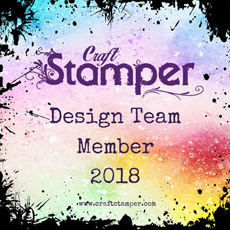 For viewing all the beautiful TIMI design team projects and for linking your take on the challenge please follow this link to Craft Stamper blog. I hope you have time to play along! Books are the best travel companions. Whenever sitting on the plain or train I like to take out my book and start reading. Very often I soon realize that I have not taken a bookmark with me. Or if there already is a bookmark between the pages it's often a piece of scrap paper, an old receipt or a worn-out ticket. I have hundreds of books, but only a handful of bookmarks. This needed to change. 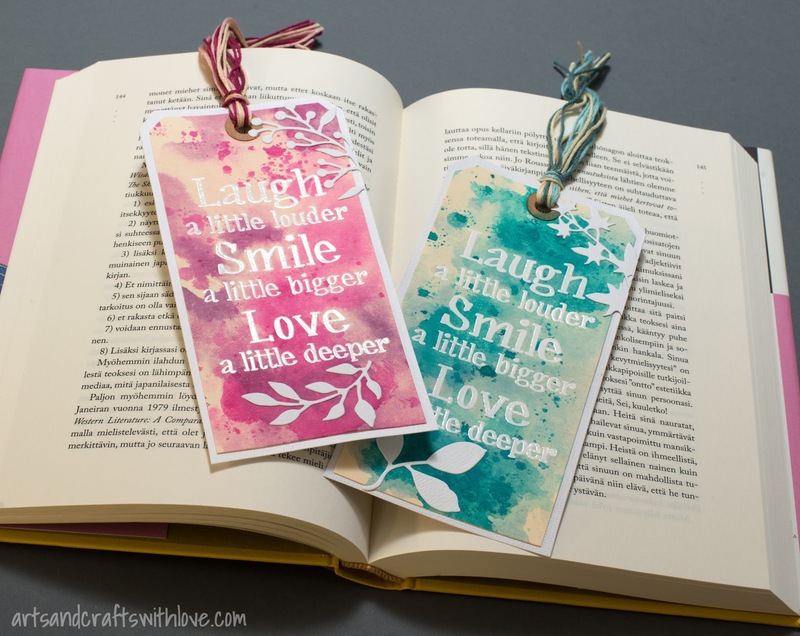 A good bookmark is not too small nor too large and most importantly not too thick. Stamping and die-cutting are perfect techniques for embellishing a bookmark as you can build interesting layers and yet keep the project thin. For stamping and colouring I recommend to use media that will be permanent and not mess up your book. 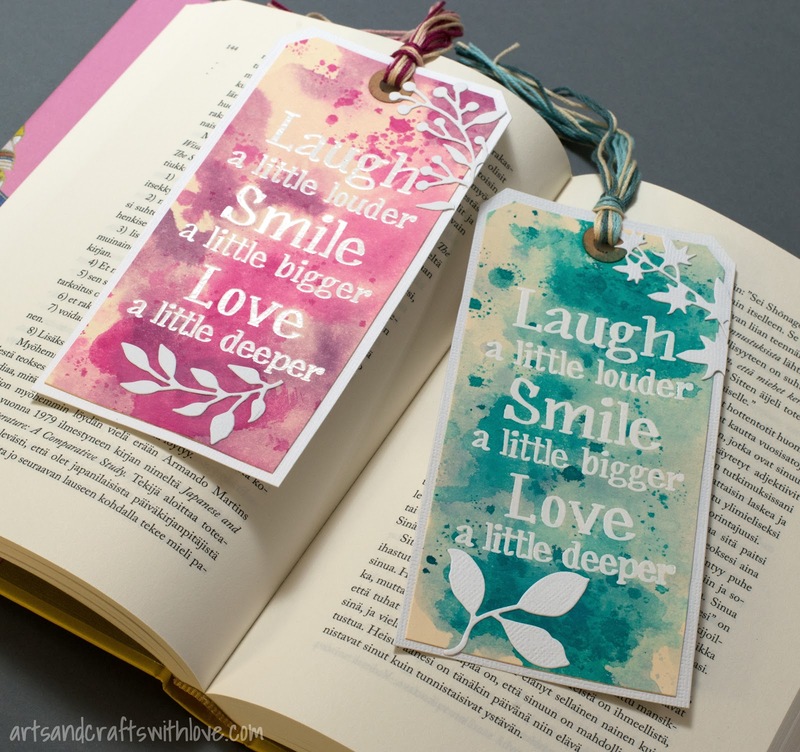 You don't want to colour the pages of your book with the bookmark! The base of my project was a size 8 manila tag. 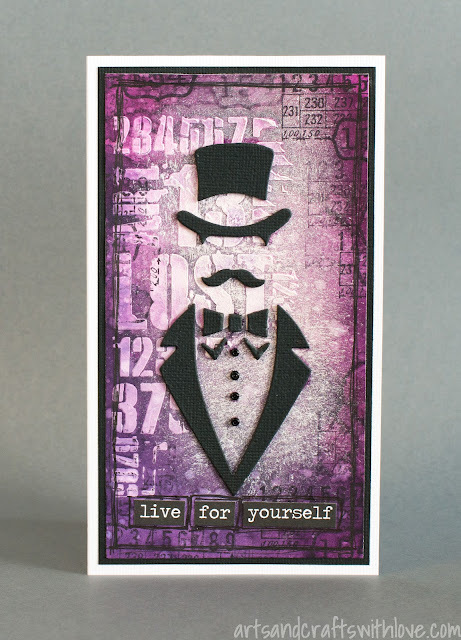 First I stamped and heat embossed the lovely quote text on the tag, and then coloured both tags with Distress stains. The white embossed text resisted the water-soluable colour, and once the tag was dry I gently wiped off the excess colour from the text with a baby wipe. The colour was not applied direcly on the tag, but dabbed on my craft mat, misted with water and then picked up with the tag. Love that result- you can not fully control the flow of colours which makes the technique so fun! 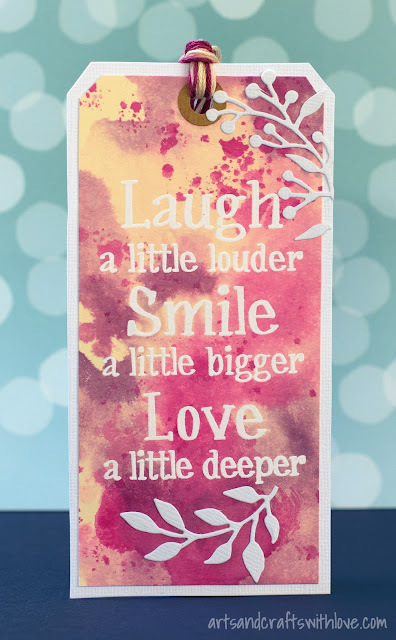 I trimmed few millimeters off from each side and glued the tag on a die-cut white size 8 tag, and finished the project with embellishing the tags with white die-cut leafs (small leafs are from *this* Sizzix set). 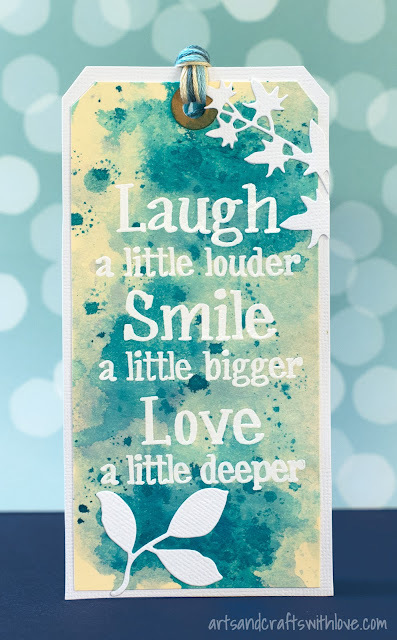 Wishing you a wonderful day! Thanks for stopping by! First I created texture on the background with white texture paste (smooth and easy-to-use paste by 13Arts is my favourite!). 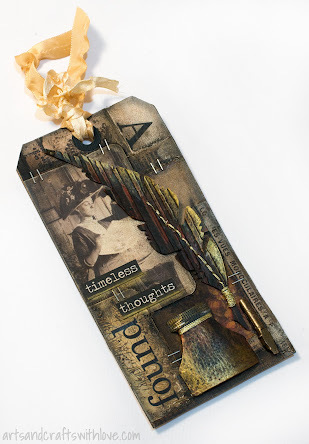 The stencil I used is a cool new mini stencil by Tim Holtz. Once dry I coloured it with two purple Distress Spray Stains, mixing the colours together with water. 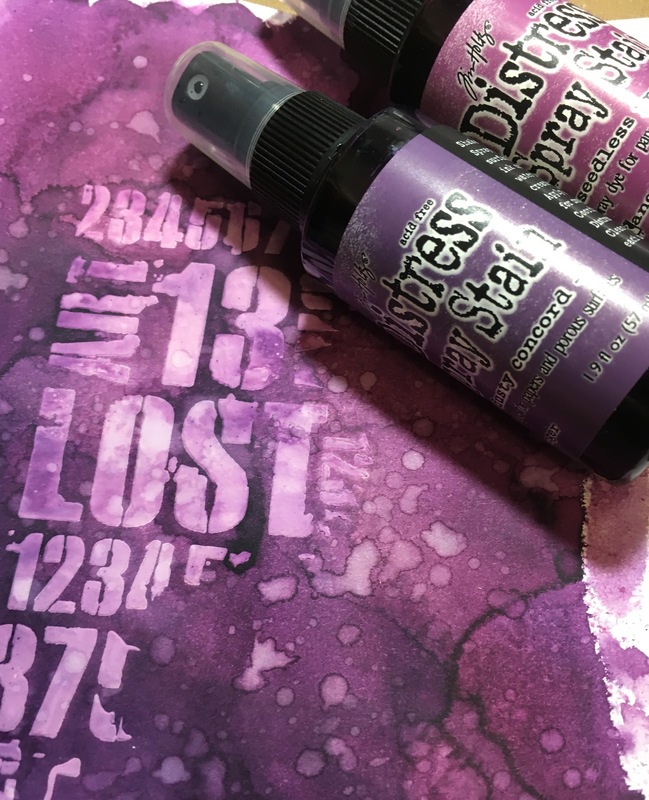 For highlighting the texture I wiped the texts gently with a baby wipe towel- the texture paste resists the water soluable mist a bit which makes removing the excess colour super easy! Additional splash marks were done with adding more water once the first layer of colour was dry. The die-cut shape has three layers of black cardstock. To make the final assembly easy I first attached the layers together with two-sided tape and then run the thick cardstock piece through my big shot. 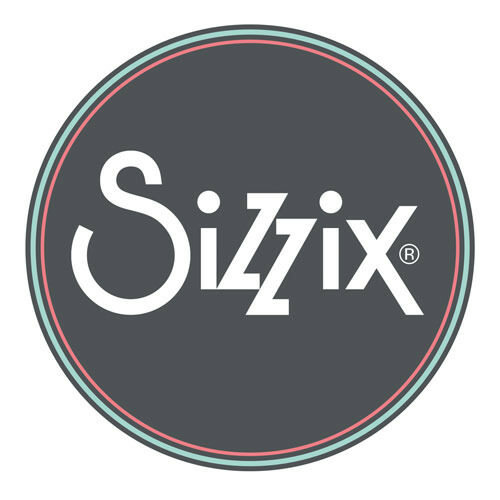 The die I used was a cool Tim Holtz/Sizzix Bigz die. Before gluing the die-cut pieces on the card front I dry-brushed bit of white gesso on the background. 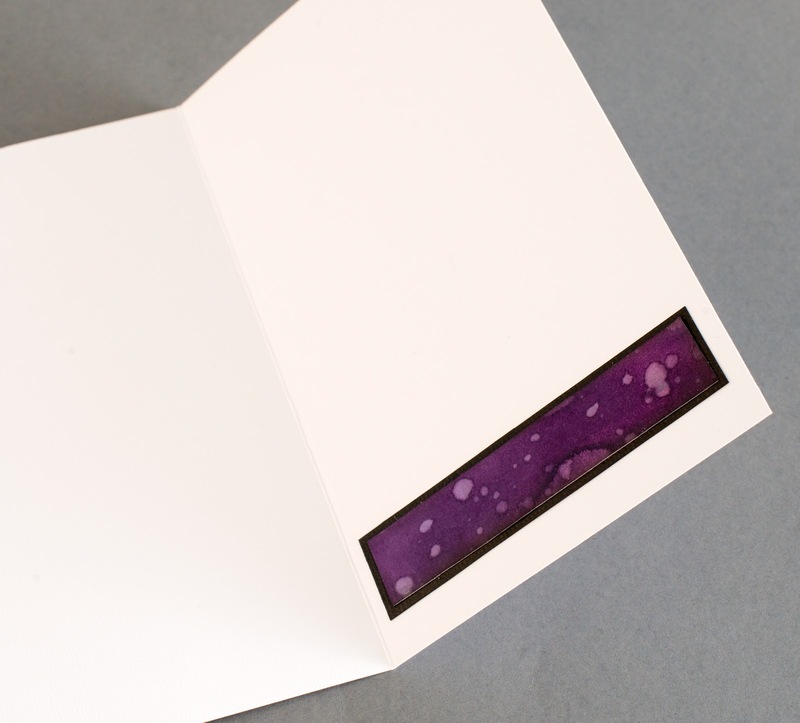 Without this gentle white wash the black image would have disappeared in the dark purple background. For finishing up the project I stamped black patterns on the edges of the card. Done! I hope you have time to play with this cool colour combo this weekend. 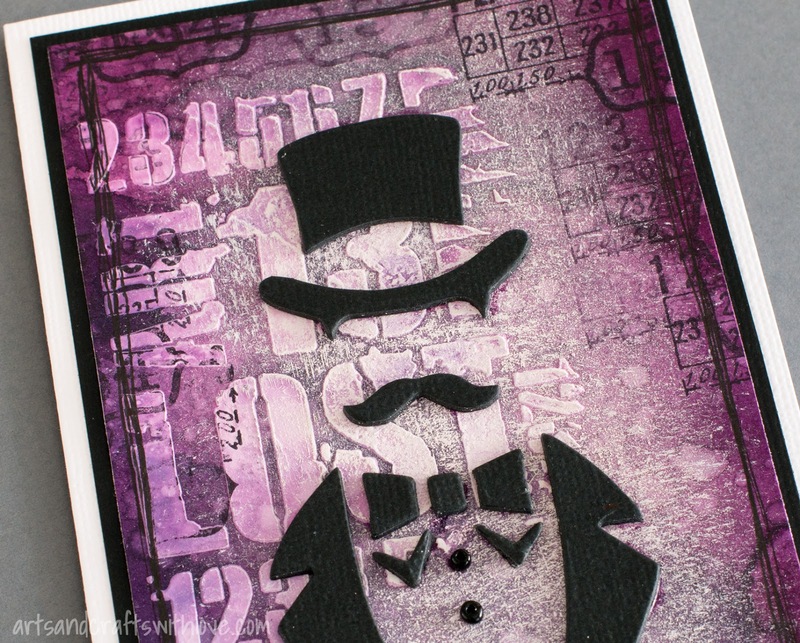 Maybe I'll soon see your mixed media card among the challenge entries! Wishing you a nice and creative weekend.